SATCOM Installations All Over The World. L3 Narda-MITEQ is a proven and recognized leader in the Telecommunications Industry with thousands of installations worldwide. Serving both the Military and Commercial Markets, L3 Narda-MITEQ designs and manufactures standard and customized satellite communication equipment. L3 Narda-MITEQ's SATCOM product line includes Frequency Converters, Translators, Redundant Switchover Units, Amplifier Systems, Video Products, INMARSAT Products, Equalizer Products, Uplink Power Control Products, Power Amplifiers and Custom Communication Equipment. Unique, full function space saving 1/3 products are available with the same performance and options as our full rack units but require 1/3 the rack space of a traditional unit. 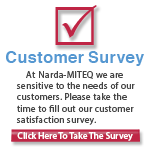 The 1/3 product line is patented #7,510,090 and only available from L3 Narda-MITEQ. 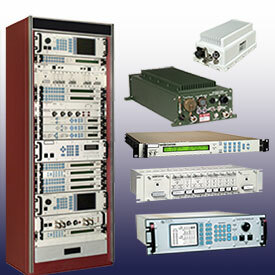 These 1/3 rack 1RU high solutions are available in the following products: Amplifiers, Frequency Converters, Translators, Equalizer Products, Fiber Optic Transmitters and Receivers, as well as in our Broadband and Ultra Broadband Products (contact L3 Narda-MITEQ for additional information on our Broadband and Ultra-Broadband product line). The Space Savings feature of the 1/3 products is unbelievable and allow you to create Redundancy, Three-Channel Amplifiers, FO Transmit and Receive, Equalizer and Switchover or even Test Translator Block Configurations in 1 RU. Think of a 1:12 Redundant Equalizer Configuration in 300% less Rack space. Now that's a savings and the combinations are endless!